View More In Light-Up Toys. SUPER-COOL LED PARTY SUPPLIES: Get lit at any party with this 36-piece LED jelly ring party favor pack with pink, green, blue, purple and red wearable light-up toys that flash with super-sparkly LED power. TURN IT ON (OR OFF): These light-up party favors have on/off switches so you can conserve your LED flashing for just the right moment - just press toy rings to party! 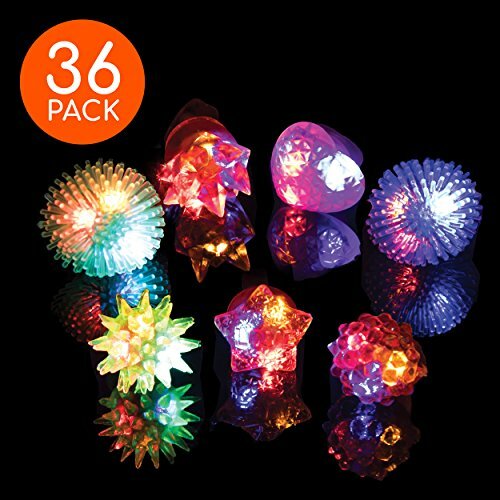 3 COLORED LED LIGHTS PER PARTY FAVOR: Cool kids and adult party favors really pack a punch with three blinking lights per piece for full-on flashy fun. BETTER THAN SUN-CHARGED GLOW-IN-THE-DARK NOVELTY TOYS: Our high-quality LED neon party favors don't lose their sparkle halfway through the celebration. HAVE A FAVORITE COLOR? Jazzy jelly ring light-up toys come in multiple colors and designs, so there's plenty of variety for everybody; perfect for boys party favors or girls party favors. Get more flash for the cash with this 36-piece LED party pack - trust PartySticks brand for top quality in party toys, birthday party supplies and glow party favors! If you have any questions about this product by PartySticks, contact us by completing and submitting the form below. If you are looking for a specif part number, please include it with your message.